Hello Again and Welcome Back. Today we received a really nice winter harvest of fresh Hawaiian turmeric with delicate young flavor and deep orange color. We also have Shing Shang and Salid Thong back in stock after about a year, and so is our All Natural Tamarind Candy. 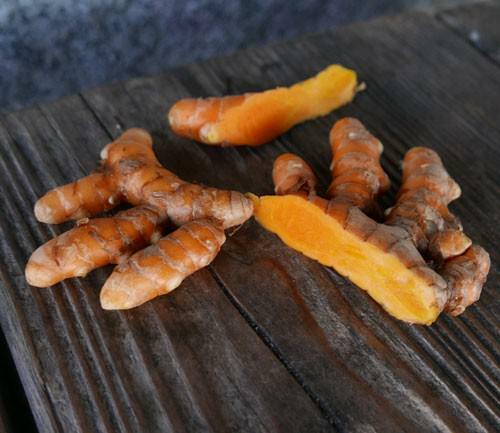 Harvested less than 48 hours ago, really fragrant, delicate turmeric with nice light color, light tips, mild flavor, and deep orange internal color as shown. Turmeric is revered for it's well-known beneficial health properties, and is a wonderful natural yellow food coloring for not just Thai food. A southern-Thai aromatic specialty made w/fresh turmeric, in a water-based soup that doesn't have fish sauce or oil. Salid Thong processed in a modern facility with advanced packaging and excellent (addictive) flavor. One of our most popular snacks, has been out of stock since last year. We have Combo and Regular flavors. A very popular snack among our Thai and non-Thai customers. We have 'Spicy' and Sesame flavors back in stock. Perfect all alone as a crunchy snack. Also, sprinkle over a bowl of fresh jasmine rice, or to add crunch to any Thai soup, stir fry or curry. All natural candy, made of tamarind, is perhaps the best candy of all. Chewy, delicious, sour, healthy tamarind fruit coated in cane sugar, chilli powder, and a bit of salt. The candy has a slight spicy bite.